Salento is coffee. Colombians want coffee and they grow some decent stuff around here. 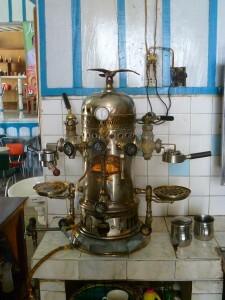 A 100 plus year old coffee machine where they make some darn good coffee. The only thing that brought me here was not wanting to take a fourteen hour bus ride to Medellin from the Tatacoa desert and this being an enjoyable, easily reachable location to spend one day relaxing between two days of bus travel. The prospect of good coffee in a beautiful area of Colombia had it’s appeal as well as there being a Game 4 of the NLDS that I needed to watch (but lets not talk any further about this game or Game 5). I wanted nothing more from this town. She just looked at me a bit oddly and with nothing more to talk about she walked away. Fine by me. I’m just here for some coffee and nothing more. I had no interest in looking at some coffee bushes. I saw a bunch of those in Guatemala without paying someone in order to see them. 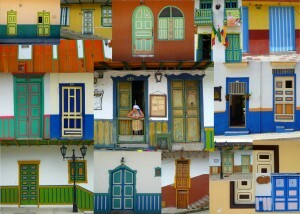 The doorways of Salento are painted in various colors giving the town that extra 'something' and making it more enjoyable. Well, institutionalize me then. I have no interest in hiking through this valley no matter how beautiful people say it is. I’ve seen some pretty spectacular valleys and mountain scenery in the past and five hours of walking in the humidity doesn’t sound like too much fun to me right now. If I have to trudge up one more mountain in South America I think my legs will detach themselves from my body and run down hill leaving me stranded on the mountainside to starve. I’m just here for the coffee. Nothing more. It was at this moment though that I realized the only thing I really want to do is get to some sunny Caribbean beaches and do some diving. With that it was settled; after Medellin I’m shooting straight up to the Caribbean coast. No more mountains. I’ve seen the entire Andean chain from Patagonia to Colombia and it’s time to put them behind me and return to a climate and locations that more closely resemble Central America. Salento delivered on all fronts for me; coffee, enjoyable scenery and a friendly town to spend a day.